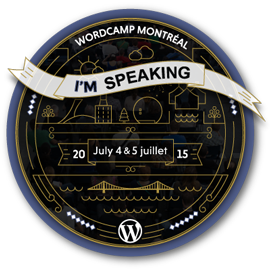 I’m honoured to be speaking at WordCamp Montreal on July 4th. I’m presenting a talk on the WordPress Customizer. In WordPress 4.1 the “Theme Customizer” was changed to the “Customizer” with the intent that it could be used as the interface for any WordPress settings. Very few plugin authors, or even custom theme authors, are taking advantage of this built in options panel. Through some examples, we see how easy it is to use the Customizer API to add settings/options to WordPress for themes, plugins (or anything).